Saeko received a call from Kotomi asking for help urgently for Kotomi's school festival tomorrow. Saeko and I came across a shop near the train station along the way. I don't know why, but those pretty things they are selling at the shop attracted my attention. I can't help myself but to check the stuff there. I don't know how much time had passed, but Saeko has quietly left me behind and found out that she's now quite close to that school. I know we can read each other minds, but can't she at least tell me that she's leaving? She has never even spoken a word to me since the night after we gained the ability to read each other minds, although this could be partly my fault for playing with a machine I know nothng of that had me end up in a cloned body of myself in the first place. Hold on, does that mean that my current mind was separated from my original? If not, then who was controlling my original body while I'm stuck in the cloned body? Either way, our minds are merged back, but still retain separate bodies with different abilities. Also, at the recent festival of my school, Kotomi did something to the device on Saeko but none to me. If that device turned me into a girl from a boy (when I was still part of my original body), but got cloned as a girl later on, doesn't that mean that I would still remain as a girl if my original body were to somehow revert back to a boy? The fact that this body i'm in now was created as a female with the chromosome of my original body not carried over, it does seem possible: I don't have any scars, my teeth are perfect, the ache in my body is completely gone, my eyesight and nails are perfect, it's like as though the body is freshly made from scratch, but still retain memories and knowledge. I even have different perspective of the daily things too and two different sets of memories from before: from the dimension Saeko was originally from as a boy and another that would fit the situation Saeko is now in. Hard to tell if the latter set of memories are made up or Saeko really did enter another dimension where she would be a rich and high-scoring female instead of a poor and low-scoring male, though it would fit me more than her though, but I am her clone after all. As I got closer to Kotomi's school, students from there seemed to have a déjà vu kind of a reaction when they see me. I think Saeko had walked past them in one direction earlier, and that I look exactly like her. 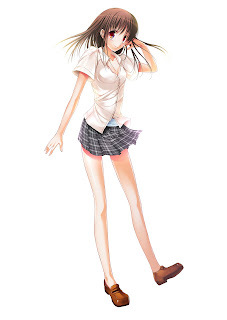 Although Saeko is now in Kotomi's class of 2-1 with her classmates, Kotomi herself is nowhere to be found. Kotomi could be around the school helping the others, but where exactly is she? "Are you looking for someone? I've seen you wandering around here a lot lately..." A girl's voice from my right entered my head. "I'm looking for Kotomi Miyazawa." "Oh, you mean the second year student council president candidate? She should be in class 2-6 now. That class hasn't really prepared for anything. When asked why, they gave an excuse about a table somewhere in the middle being cursed or something. Anyone who sits there or move the desk would immediately feel dizzy and faint. ", she explained. Class 2-6 was my former class. A cursed table? There wasn't such thing when I was there as Itsuki... and since when was Kotomi even in the council??? I headed to the classroom, and though I am very familiar with the place, I fell uneasy walking around. To avoid the possibly-crowded corridors, I walked through the courtyard and towards the stairs nearest to the class. I (as Itsuki) used to like to hang out here to have lunch with Kenjiro if I wasn't with Kotomi. It was also here where I bought photos of girls (as a guy) from people in the photography club who were discreetly selling them from being found out when the clubs were actively promoting their clubs during my first few days here last year. Besides field trips, the sports and cultural festivals, this is one of the few rare opportunities they could take pictures out in the open. I then reached class 2-6: my former class. Looking inside, only the back half of the class is decorated. There are black curtains to separate the two halves. I don't know what they are planning to do as all the desks at the front half are in their usual positions, as though it were to be a normal day. One of my former classmates, whom I know very little of, spotted me looking inside. At my current state, he only knows me as the girl from an elite school who is somehow interested in the Kenjiro of this class. As though knowing what was on my mind, he called Kenjiro out and brought me to him. Kenjiro: "Oh? You have come to see me again?" Me: "Not exactly... I'm looking for Miyazawa-san. Someone told me I could find her here." Kenjiro: "She was here a while ago, talking to us about moving the tables around. But she abruptly ran out, saying that she would be back. She seem to have a puzzled look on her face, like she's clueless as to why she would suddenly want to go to the toilet." The toilet is on the other side of the corridor, so I did not see her as I entered the classroom. 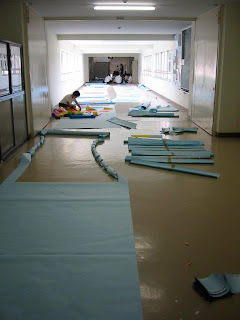 Then again, the corridor is crowded with people making final touches to the place. Knowing Kotomi, she would avoid unnecessary trips or at least inform other people and walk out gracefully, and make dash when no one, except me, is looking at her. Kenjiro: "She was calm until she placed her hand on that table. That table is cursed: anyone who sits there or even touches the table would feel bad, but not serious enough to land in the hospital so far." He pointed to a desk I was sitting at until May. I'm puzzled: Why is the very table I sat at cursed? Is it a preventive measure so that no one could sit at my place? But why? I didn't ask for it, and until a while ago, neither do I know about it. Could this table be the very reason why Kotomi called me over? Kenjiro: "From what I can see, I can see exercise books identical to ours. Our year is the first batch to use those textbooks, so it's a mystery how it got there. From what I can see, it seems to have 久川伊月 (Itsuki Hisakawa) written down, the same family name as you. Do you know who that is? Your brother? That family name is not common." Itsuki was one of my former names, but I'm not sure if I should tell him that. But he won't believe me anyway because of the mass differences of the me before and after the change. I'm surprised that the textbooks are still here. I'm guessing that this so-called curse is to prevent other people from discovering, but how do I pick it up and end this silly curse? Me: "No, sorry. I don't know who he is." Kenjiro: "It's because of this table that we can't really plan properly. It wouldn't really be a problem if the table were to be at the corners of the class or at the dead center, but this one is somewhere in-between and is highly prone to be knocked over. Anyone in my class who are not part of any club or committee are in that other half or just lazying around. It's too small in there to have what we really want and.... Hey! You're sitting on that cursed desk! Oh no, you will be cursed very badly! Get away from there before it gets worse!" I was sitting on top of the desk while trying to transfer the contents of the desk into my body while they are not looking. I just remembered from the time I stuffed my original body inside me, only this time, I just need to make physical contact with the table (and feel that I'm glued to it) to start transferring the items. To others, it would seem that the items had vanished into thin air. Even though sitting on it at first is slippery due to the swimsuit on my body under my uniform that is impossible to remove or cut, it has been quite useful: because of this, I am still shocked to find myself still alive and fine after being run down by a high-speed van or stabbed on various parts of my body with a knife multiple times. Since mine and Saeko's minds are merged, I think we would still be together should her body somehow die. When I was done, I carried the table aside and continued with the rest. Others were shocked that nothing happened to me, on top of being the one who had contact with the table the longest. Besides, why would my own desk curse me? Me: "See? The curse of the desk is gone. It's now just an ordinary desk as anyone else." Everyone: "W-What did you do?" Me: "Well, when Tanigawa-san mentioned the name written on the book, I was guessing that this could be the legend of a wandering spirit that has been passed down from generation to generation. Although harmless when not provoked, it can make you think that someone sits at a place even though there really isn't anyone. Did anyone felt anything odd about the table before prior to preparing for today's festival?" Girl A: "Well, I did felt that someone was actually sitting there until May..."
Kenjiro: "Yeah, until then, it was this same presence had been around since the beginning of last year. For some reason, this same presence feel like you, Hisakawa Mamiko-san. Speaking of which, I think I might have seen you before the preperations of the festival..."
Me: "Well, that spirit did originate from my family some time ago. Um, it could also be preparing you to meet me before the actual event? Even I don't know the mystery of my own family history... so er...."
I'm at a loss of words to say. Fortunately, Kotomi came to rescue me. Kotomi: "...why do I have this sudden urge to to head to the toilet from the moment I touched Itsuki's table? I'm his girlfriend you know. Does that table not know me? Oh, Mamiko-chan, you're finally here. I have something important to tell you, something we can't discuss here. Oh, and 2-6, I'll be back again." "The curse should be gone now, but I can't guarantee that it won't come back." I don't know where Kotomi was dragging me to and I was preoccupied about what other people would think if they saw us and what would happen that I didn't pay attention to where we were going.